Given that TRACE is a youth-leaning music channel and a hub for all things pop culture, it’s no surprise that the platform is targeting young people in universities in an upcoming campus tour called Trace In The City. The month-long event will sweep across seven cities across Nigeria, bringing the best of life’s experiences at campuses and cinemas through a fusion of music, games and movies. Furthermore, TRACE is also giving young creatives a chance to connect with the platform, meet the faces behind the channel and submit videos or skits in a “Content Festival,” in conjunction with the Nigerian Television Authority (NTA). The tour, which will last for four weeks and visit seven cities, will feature a concert, games such as an eating competition, Indomie and Pepsi product giveaways, The NTA Content Festival and take over a movie theatre in each city. The locations include: Zaria, Abuja, Calabar, Port Harcourt, Benin, Lagos and Ibadan. “We decided to embark on this campus tour because the country’s entertainment scene is dominated and consumed by young people and they are eager for opportunities to have their creativity recognized. To respond to their aspirations, we partnered with NTA so they can drop their videos and submit content to air on TV,” said Mr Sam Onyemelukwe, Managing Director for Trace in Anglophone Africa. Artistes to rock the stage include Ice Prince, Mayorkun, Reekado Banks, Harrysong, Falz, Dj Neptune, CDQ, MC Galaxy, Classiq, LAX, Teni Entertainer, Dremo, Peruzzi, Idowest, Yonda, Odunsi The Engine, Ceeza Milli, Tjan and many others. It will also feature each university’s popular acts. The city tour which starts on the 17th of August 2018 till the 15th of September, 2018 is proudly sponsored by Indomie Nigeria, refreshed by Pepsi, supported by Infinix Mobile and Clorets. 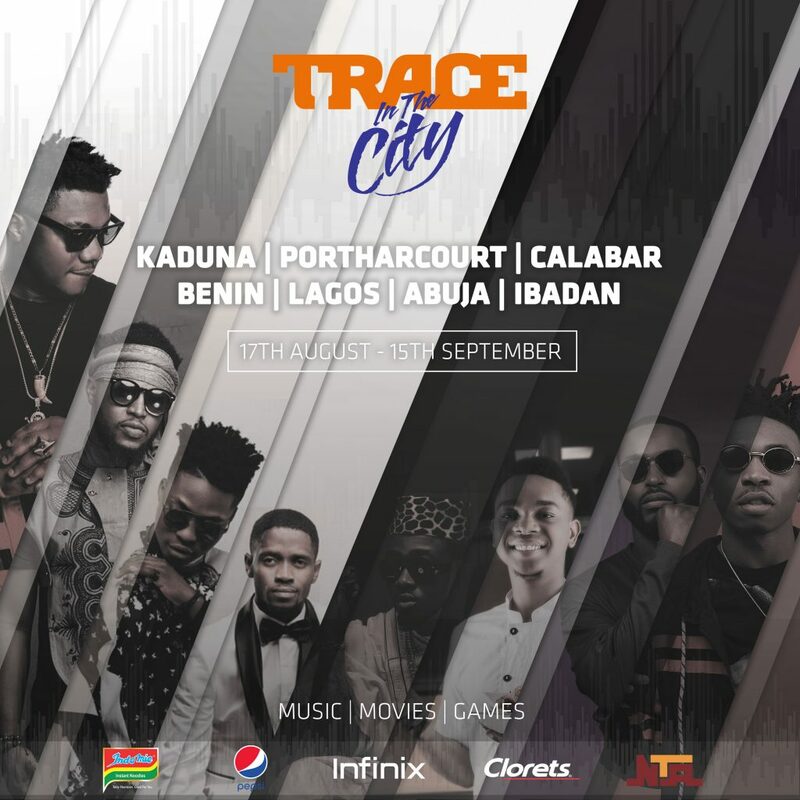 Follow the conversation on all TRACE’s social media platforms using @tracenaija on Facebook, Instagram and Twitter or by using the hashtag #TraceInTheCity.